Captain Scott, R.N., C.V.O., looking for Ice. Recto: A black and white photograph within a black border showing Capt. 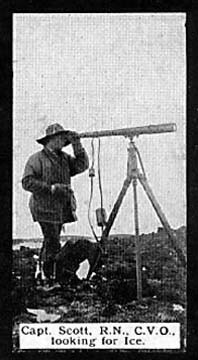 Scott looking through a large telescope on a tripod. The caption reads: Capt. Scott, R.N., C.V.O., | looking for Ice.